This is our line of premium Scandinavian derived organic bath and body baby products. They were formulated using pure therapeutic grade organic essential oils. 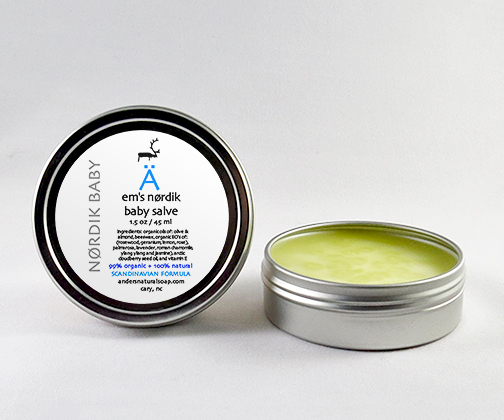 Our Nørdik Baby Scandinavian Salve was formulated using an old Swedish formula to create a wonderful Scandinavian Salve. We are very proud of this line offering as Mike&apos;s grandparents emigrated from Scandinavia; his grandfather from Finland and his grandmother from Sweden. Our Scandinavian Salves are packaged in a silver metal tin with a screw cap and a round label attached. Rosewood essential oil is sometimes referred to as Bois-de-rose Oil. Aromatically, the oil has a subtle, yet surprisingly sweet, woody, fruity aroma with a floral quality to it. I don't typically refer to wood oils as "beautiful" oils, but this certainly is a beautifully aromatic oil that holds a dear place in holistic aromatherapy as well as natural perfumery. It is a versatile oil that blends well with other wood, citrus, spice, herbaceous and floral oils. This essential oil is steam distilled from the leaves and flowers of the Rose Geranium plant. It has a gentle floral scent with a minty fresh finish. Geranium essential oil has been shown to have anti-inflammatory, antibacterial and antioxidant properties. Used in skin care, it can help balance the function of the oil glands and has cellular regenerating properties. This essential oil is steam distilled from the plant. Palmarosa essential oil has a sweet, floral fragrance with a hint of rose. Ylang Ylang Essential oil, (most floral), Indonesia, is powerfully floral, extremely sweet, with floral-woody undertones. The complete Ylang Ylang is obtained by continuous steam distillation of the fresh flowers. This complex oil is considered one of the most exotic essential oils available. While Rose is referred to as the “Queen of Oils,” Jasmine is known as the “Queen of the Night.” While most Jasmine flowers bloom during the night, this oil comes from the Jasmine that blooms during the day and is considered the fun loving fragrance. One of the best oils for skin care and can be used for all kinds of skin, though it works best on dry, sensitive skin. This essential oil is steam distilled from the petals of the rose flower. Prized as a premium essential oil, Rose essential oil is refered to as “The Queen of Oils”. Rose essential oil is very valuable and rare due to it&apos;s high cost to produce. We recommend that you apply your Scandinavian Baby Salve every day. Because of the heavy formulation only a small amount will be necessary. It may seem a little greasy when first applied, but it does readily soak into the skin, doing its job of quick healing. Smooth into skin, massage gently and enjoy your soft skin and great Nordic Baby scent.